The campaign to collect signatures for a potential rent control vote in November officially started this weekend with a kickoff event at MacArthur Park but it didn’t take long for opponents and supporters to clash and now both sides are claiming to be the victim. The rent control ballot initiative is being headed by a coalition of community groups including Housing Long Beach, a tenants rights group that for years has fought to bring stronger renters protections to a city that has about 60 percent of its residents paying rent. Even before the group publicly announced its intentions to put the issue on the ballot property owners have regularly denounced rent control during public comment periods, but now the clashes have transitioned to face-to-face encounters. Karen Reside, a member of the Long Beach Grey Panthers and signee of the original petition to circulate the rent control measure, said that opponents of the effort showed up at MacArthur Park this weekend with a megaphone and anti-rent control propaganda which were glued to public buildings and light poles and placed on people’s vehicles. Reside said that in addition to placing misleading information on public property and people’s cards, an unidentified property owner followed her and another person to an area grocery store where they intervened in their ability to gather signatures. “He was quite intense and quite loud and I kept saying what he was saying was not true but he kept people from signing the petition, he made people nervous and the manager of the store came out and told us that we had to leave because he was getting complaints from his customers,” Reside said. 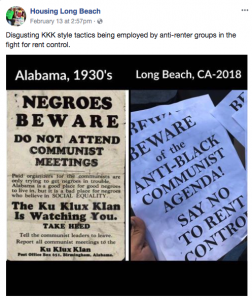 The Housing Long Beach Facebook page shared an image of one of the fliers being passed out over the weekend by opponents of their efforts which cast the rent control crowd as “anti-black” and “communist.” The group likened it to tactics used by the Ku Klux Klan last century, putting the image side by side with a flier supposedly from 1930s Alabama. Joani Weir, who created the group Better Housing for Long Beach, not to be confused with Butler’s Housing Long Beach, has been a vocal opponent of nearly all efforts pursued by community groups, including the Proactive Rental Housing Inspection Program, and other failed efforts to have the city council adopt just-cause eviction protections. Weir denied that her group participated in passing out the racially charged fliers. She added that anything that her group puts out she puts her logo on, then insinuated that the fliers may have been the work of the pro rent-control crowd to stir up controversy. She did deny that there was a confrontation in front of the grocery store, but said that it was merely the result of a lot of informed and concerned renters and property owners frequenting the store and being opposed to rent control being enacted in Long Beach. Weir said that it’s not in hers or other property owners’ interests to be divisive as they rent out properties to people of all backgrounds, but said that the fight for rent control in the city would likely remain divisive as the signature gathering process continues. She also claimed that it was a suppression of her group’s freedom of speech for a threat to call the cops for littering to have been levied by the other group. “It’s going to remain contentious if they keep trying to silence our voice because they don’t want the truth to get out about how rent control has destroyed these cities,” Weir said. According to the city’s municipal code it is illegal for the posting of bills to be made on public property without consent from the city. While it is legal for signs to be posted on private property, it typically requires consent from the property owner. A representative from the city clerk’s office said she was unsure if leaving fliers on cars would fall into the realm of being illegal. The ballot initiative, if passed, would set a cap on the amount that rents can increase year-to-year at 5 percent or 100 percent of the increase of the consumer price index. It would limit rent increases to once every 12 months, require relocation payments, establish a rental housing board that would adjudicate petitions, determine allowable rent increases and set fees that rental property owners would pay to fund the board’s activities. Those collecting the signatures have until the end of July to collect roughly 27,000 verified signatures for the initiative to qualify for the November ballot. They expect the interference encountered this weekend to continue, but remain optimistic that they can hit that number and the voters will favor the rent control ordinance when they head to the ballot box.